I really liked this Mark Casse colt going into the Bluegrass Stakes (G1). There was a ton of early speed present in the field, and consequently, the race set up for two horses in particular – this guy and the eventual winner Dullahan. Prospective was fresh off two solid efforts at Tampa Bay Downs and appeared to be coming into the race the right way. He had a good post and the surface was not an issue, as he was already proven over Polytrack. Things could not have been better in the first six furlongs of the race as Prospective sat a beautiful trip. But when the real running started, Prospective threw out the anchor. He finished sixth, beaten only about 6 lengths, but that is actually a pretty sizeable margin on the synthetic surface. This was not a good performance, especially given the circumstances and the favorable race setup. The son of Malibu Moon isn’t good enough to be competitive in Kentucky Derby 138. This colt comes off a nice, closing 2nd place finish from an outside post in the Louisiana Derby (G2). It’s just too bad for this guy’s chance that this particular stakes race was one of the worst renewals I can ever recall. It was a pretty bad field, especially for a “major” prep 5 weeks prior to Kentucky Derby 138. The horse who beat him at Fair Grounds (off at odds of over 100-1) returned to run a poor race in the Bluegrass Stakes (G1) at Keeneland. One positive with this horse is trainer Larry Jones, who is one of the best in the business and has Derby experience in his corner. Another positive note about the son of Proud Citizen is that he is an honest runner. 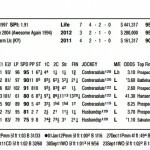 Aside from his fourth place finish in his career debut going 5 furlongs, he has never run a bad race. However, the Kentucky Derby is going to be a huge step up in class, and he has not shown the type of ability against top class runners to think he can overcome that hurdle. He has only surpassed a 94 BRIS Speed Rating in one career start and that was his 101 in the Risen Star. Mark Valeski is the type of longshot that could get 4th in the Derby at big odds and it would not be a huge surprise based on his overall honesty and consistency. However, hitting the board seems out of the question. Inbred to both Mr. Prospector and Secretariat, it goes without saying that El Padrino hails from a very class family. His dam is an offspring of the Mr. Prospector mare Chic Shirine, who produced two Grade 2 winners and is a full sister to 1991 Champion Older Mare Queena. So, I don’t believe that distance is any type of concern for this son of Pulpit. Class and stamina are present throughout in his bloodlines. El Padrino was the “hot” horse after his smashing win at Fair Grounds in the Risen Star Stakes (G2). Although he only scored by a nose, he did so in pretty good time, with the runner-up well clear of the show horse in the large 11-horse field. The Todd Pletcher trainee caught many players’ attention in his prior start, his first of his three-year-old year, when he ran a monster 111 BRIS Speed Rating in an allowance win. He then ran a 101 when winning the Risen Star, and followed that up with a 100 fig when racing an even fourth in the Florida Derby (G1). His Florida Derby effort was just fair and he was clearly no match even for the show horse, Union Rags, who had a less than ideal trip. This colt may be good enough to win the Kentucky Derby but I believe his first two starts of the year have caused a regression. He is not coming into the first Saturday of May the right way – peaking. In a year when the Derby is very strong and there are many serious contenders, that is enough for me to throw El Padrino out. 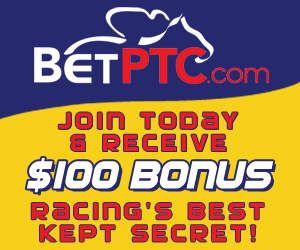 Sign up with Premier Turf Club and get free money to wager on this year's Kentucky Derby! It’s 17 1/2 days to the 2012 Kentucky Derby and this year’s race shapes up to be one for the ages. Just a few weeks ago it looked like Union Rags would be the prohibitive betting favorite on May 5, but with his loss in the Florida Derby (G1) and some huge wins by other horses, that has all changed. 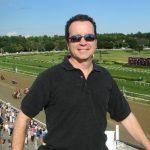 Every day here on AGameofSkill.com I am going to analyze one or two entrants for Kentucky Derby 138. Is the horse a contender, a borderline player, or a complete toss? I haven’t always been right about the Kentucky Derby. A few years ago the New York-bred gelding Funny Cide made me look a tad foolish. But when you’re right on Derby Day, as I was last year with Animal Kingdom, it makes the opinions of horses like Funny Cide a distant memory. Today we will look at Alpha and Went The Day Well. The current Wynn Future Books odds are listed next to the horse name. This son of Bernardini certainly has the pedigree to run all days and that bodes well for his chances. After back-to-back wins over the inner track at Aqueduct, he then finished a troubled 2nd behind Gemologist in the Wood Memorial (G1). He has only run one poor race in his lifetime and that came in last year’s Breeders’ Cup Juvenile (G1), contested at Churchill Downs. Unfortunately, I don’t think this colt is fast enough, and I don’t like that he campaigned over the Aqueduct winter track. Although he has run decent 100, 100, and 101 BRIS Speed figures in his three sophomore starts, he is tad slower than the best runners on May 5. 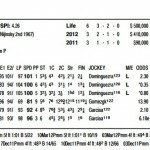 Those are typically not the numbers of a horse sitting on a Derby victory. 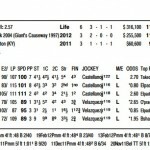 His Late Pace Ratings are decent as well, but again, he just doesn’t show the brilliance of a Kentucky Derby winner. He is certainly a horse that could hang on for a piece and get owner Goldolphin Stables their first in-the-money performance, but I don’t like him for the win. Status: Throwout for the Win. Contender for the Exotics. The Vinery Racing Spiral Stakes (G3) was held at Turfway Park on Saturday, March 31, and again the red hot Team Valor stable had a live contender in the field in Went The Day Well. In 2011 Team Valor won the race decisively with Animal Kingdom, and Went The Day Well was nearly as impressive as his older stablemate’s victory. The son of Proud Citizen sat a stalking trip, covered up during part of the running. He moved into contention turning for home but then quickened when asked to maintain his position inside of longshot Heavy Breathing, trained by Todd Pletcher. That duo continued to outrun their rivals into the straightway, with Went The Day Well still on his wrong lead and racing a tad greenly. John Velasquez pulled on the right rein to show him the other horse and prompt him to switch leads, and Went The Day Well responded. He switched leads, quickened again and pulled away from Heavy Breathing to win going away at the wire. It seems like every week that Team Valor International is capturing graded or group stakes somewhere in the world, and they have another live longshot this year with this runner. Their colt earned a 103 BRIS Speed Rating, a career best, for his Spiral win. He is certainly an improving horse at the right time of the year and has already proven that he can handle dirt. He hails from a female family that passes on a lot of class and stamina, and therefore, should have little trouble with the added distance that the Derby presents.